5:15pm – 5:30pm Cam 1-2 Backyard Jozea, Paul and Frank are talking. Jozea tells Frank that after when he watches he will see that he always went to bat for him. Even when the veto thing.. I knew he was going to pull himself off. I had to say save yourself. You can’t say friendship. Maybe I’m playing the game too sweet. Maybe I need to play vicious. Paul says I really think you’re fine.. his just general deminor … its like he’s just accepted defeat. Unless there’s some grandiose scheme that none of us have heard of… which I doubt. Frank says yeah this house is too small. Paul says it would have to be that you were getting f**ked over by three of us. Paul tells Jozea to just play it cool. The talk about the roadkill competition. Paul says he doesn’t know who the f**k put him up. They didn’t tell anyone .. anyone! Paul says for all we know it might have been Frank. Paul laughs. Frank laughs. In the safari room – Tiffany and Paulie are talking. Paulie and Tiffany agree to look out for each other. Tiffany says we don’t want people to know we’re working together. Paulie says we have a good shot at competitions. I honestly think we could steamroll through to the final 6. 5:35pm Safari Room – Frank tells Tiffany and Paulie about his conversation with Jozea/Paul. Frank says he (Jozea) is just nervous. I told him the few days before the evction are hard. Just relax. He told me that Paulie just wants to enjoy his last days. Nicole joins them. HOH room – Corey, Michelle and Zakiyah are talking. Michelle says almost time for HOH. If I win I wouldn’t let any of them up here. I don’t think they would want to come up here though. 5:50pm Cam 3-4 In the bedroom – Da’Vonne tells Tiffany to be careful because you’re making James nervous by talking to the other side. Tiffany says James is the one talking all day and being with the other people. Are you kidding me? Tiffany asks who does he think I’m working with? Da’Vonne says he doesn’t know. I think that scares him. Tiffany says I make him nervous because I am Vanessa to him. Da’Vonne says there are more of us that feel iffy about him. He is just one person who feels some type of way about you. Tiffany asks you promise me you have my back. Davonne says I do! 6:15pm In the storage room – Victor, Natalie, Bronte and Jozea find shoes in the storage room that are only for #TeamUnicorn. They’re confused why only they get new shoes. James says he isn’t sure why only they got the shoes but that they give us shoes so we don’t mess up our own. 6:25pm – 6:40pm Cam 1-2 Hammock – Tiffany tells James that coming into the house she knew she wanted to work with James. People were saying the vote were going to be 7-4 so it might be a good idea for you or Frank to vote the other way to not show your cards. So you can continue to play both sides. You could cover your a$$ to not get those girls mad at you. James says the sides are pretty cut and dry. Vic and Jozea are talking about moving in together. The sides are pretty obvious. You coming for me bro.. bring the heat! Tiffany says some times I feel like you look at me and you see my sister. We’re not the same. James says you do remind me of your sister. Tiffany says I just wanted to make sure everything was cool because you looked at me weird. James says I didn’t mean to. I’m glad you’re coming to me about it though. As far as I know everyone is voting the same way, right? Tiffany says yeah. I just hope people don’t flip. Its okay if you do but we don’t want others to too. Tiffany asks if the HOH will be team stuff. James says I’ll have to lose .. I’m going to have to make sure they lose. And Hope and pray to god they lose. Trip Bronte up, kick Natalie in the back or knock over the letters or something. Tiffany asks James if anything happened with him and Meg in the jury house. James says no .. whatever happened .. happened after the show. 6:50pm DaVonne says I just did damage control with Tiffany. I’m convinced she head the conversation. I’m tired .. I’m tied. My kid is at home, I’m not her parent. Frank says I know, I don’t want to babysit somebody. We only got to babysit her for a couple weeks though. DaVonne says yeah. Frank says She’s 32 years old! Frank says he asked in the diary room and they said they were going to lock us down around 6am tomorrow. I asked if we would get out of these pixel costumes. And they said they would let us know. Frank says I think we’re going to have to compete in a competition tomorrow. I think there’s going to be the first part of the HOH tomorrow. That’s why they gave the shoes today. Frank heads to the kitchen and they talk about what might happen. 7:10pm In the backyard – Nicole and Zakiyah are making a dance routine. So basically Day is cause paranoia amongst the 8 pack. What is she doing? I think Da’Vonne is trying to keep the group somewhat fragmented so no one gets too close without her being in the mix. Of course that means she’d have to be aware that’s what she’s doing. I’m not too sure about that but maybe she’ll be able to take advantage of it. and got herself booted off. Da needs to go ASAP! it’s a little early to start turning on your own alliance. i also think it is odd the way nicole goes on about james. like no one watched his season or something? can’t figure out the reasoning behind it, too early to lose the numbers imo, and this stuff gets back to people. Nicole is trying to be miss know it all. She thinks she’s the most seasoned vet, acts like it anyway. Also has a lil arrogant attitude in her own way. Of course Nicole is the most seasoned, she’s been evicted more than all the others. This is what I predicted would happen in my comment on Friday night. It was six long days until they got the chance to vote, and it was inevitable that they would start questioning the allegiance of some of the 8-pack. 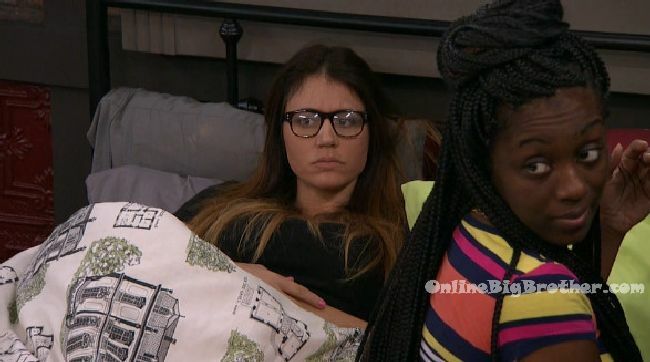 Of course, Day has been the one bringing up her doubts the last few days…first saying they couldn’t tell Tiff everything because she’s too volatile (granted, I agree), but then prematurely saying that James should be watched because he was too friendly with the other side. She’s unable to stay patient and wait to see how the vote goes on Thursday, before she starts creating unnecessary drama. And Tiff telling James to change his vote tells you that she is an extremely unreliable alliance member. I think tiff said that to James to see his reaction. Gauging his loyalty since Day told her that about James. This is 100% going to bite her in the @ss. They had a good thing going! Wyd?! I hope Jozea NEVER leaves. He is pure, un-selfaware gold. Thumbs up mrs. Mac for funny..
And there it is… Day is going to throw the vote and blame it on James. Bye Bye Paulie! I am starting to think Day may throw a vote too and either blame James or Tiff. Will be funny if as some have said that BB won’t be giving the actual vote count out this year. Never turn on your alliance of the majority within the first 4 weeks. Wtf is Da’udry thinking? I don’t get the problem. James listens then shares. Otherwise it would all be guesses. Someone soon will catch on to Day. Ok who do we hate today. A couple may already be there and they are just appeasing her to stay safe. Some of the folks are super unaware this time. Others will watch and see a week too long. so many opportunities for small alliances right now. That’s interesting. The pixel blur outfit kind of fits Michelle’s personality. She’s basically a smudge. An hour after Day pulled an Audry, she talked to Tiffany about a strategy to get the boys out. If Tiff were smart she would have caught onto Days game that she just planted the paranoia seed with Tiff to get the boys out of their alliance starting with James. Every time Michelle’s on screen I FF. Such a sour puss. Don’t understand what Da thinks she will accomplish spreading the paranoia virus around. I agree with those who said it’s way too early in the game to start this. I was starting to get impressed with her game play but now she’s becoming a big dissappointment. Don’t like her going after James. Not one little bit. Tiff trying to get James to change his vote is smarmy. 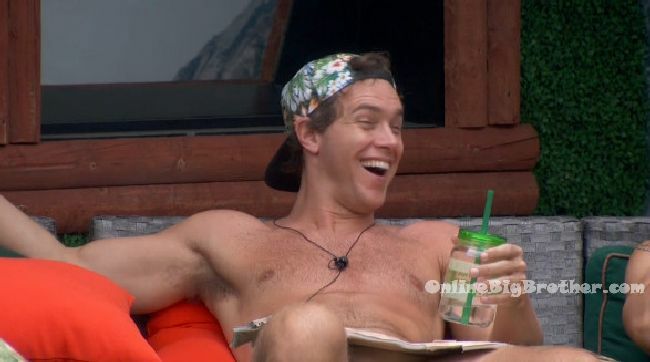 All James has done for the vets is a good job spying on the newbies & reported back everything they said. C’mon James…………watch your back around Da. Can’t wait till her duplicity bites her back. 8pak will start comparing notes on Da right after next hoh if Da doesn’t win. I see her as a roadkill nom. In those pictures, Tiffany really looks like a weird love child of Vanessa and Audrey. The house guests better rummage through her stuff to see if they can find that damn green beanie.. and hide the blankets before she goes all “have not room ghost” and starts singing “Is this real”. Up vote if you’re rooting for a returner down vote if you’re rooting for a newbie as you’re favorite. I’m just curious everyone’s thoughts! Do you think Da would be able to talk if they tied her hands behind her back? And for the love of God, Nicole, stop WHINING!!! I was all for Paul being the first one out until I heard Jozea ‘age shame’ Glenn. I hope when Jozea turns 50, there’s someone there to make him feel like a big pile of crap for being, what he calls, old. They all wanted to count the guy out before he could compete in the first comp! CBS needs to cast people of ALL sizes, ages, shapes and races. C’mon, it’s 2016 for God’s sake! Jozea give us our damn hat back. Always so much complaining about the cast. Well, here’s my take on it. Paul- Obnoxious and loud but will probably grow on you. I thought he was pretty funny on BBAD. he’ll most likely last awhile. Josea- He’s like every homosexual that has been in the house. Except, he is a lot more ignorant. Michelle- Definitely reminds me of Nicole, which is good to me. It doesn’t hurt she’s a total hottie. Corey- He’s playing with the vets and getting close to Nicole. Its a good move. He’ll most likely get to jury. I’m surprised there isnt talk about getting guys like this out fast. The newbies are more worried about the vets…..
Bridgette- Genuine person. Energetic. She just seems like a nice girl and I like her so far. Bronte- Her voice is causing people to not like her but she seems to be a genuine person as well. Seems shy though. And I can relate. Natalie- She’s eye candy of course. She does seem athletic so maybe we’ll see her do better in physical competitions. Victor- Well, he likes to flirt lol. Usually, this early guys like him would be big targets but the 2 week of safety works to the advantage of him. He seems alright and I think he’ll do well in competitions this year. Tiffany- Its like having Vanessa in the house again. However, I think I like Tiffany more. But that could obviously change. She most likely will make it to jury but not going far like Vanessa. Paulie- I like him. He seems like a loyal guy. And if he’s like his brother than that statement will be true. Now for the vets. I like James and Frank coming back. Obviously both were fan favorites so that’s amazing. I don’t get the hate for Nicole. She also has a cute voice not annoying at all. Hopefully, Corey isn’t distracting her too much. I never liked Da’vonne and I don’t know why she’s back on but hopefully, she is gonna play a different game. All in all Glenn was an unfortunate eviction right off the bat but I like the cast. They’re entertaining and I’ll give it a couple of more weeks before I decide to say this cast is bad because to me it isn’t. I like the cast so far, but wish bb had a more diverse age group. I’m ready for obnoxious Jozea and annoying Paul to leave. And can’t BB producers find a better representation of the gay community than the stereotypically, annoying choices they’ve made with Jozea and last season’s Frankie? Damn Da!!! WTF are you doing? I wanted to root for you I really did, but if you wreck this alliance…… Go back to sleep please! I like this cast do far, but wish bb had a more diverse age group. What’s 8th pack problem with Tiffany? She’s not doing anything. Am I missing something?